Is the upgrade to Dragonframe 4 free? If you purchased Dragonframe 3 on/after January 1, 2016, you have been given an upgrade license. Use the Find Your License page to retrieve it. If you purchased Dragonframe before then, you may purchase the upgrade from our store. Is there an individual student discount? Yes. We offer the full version of Dragonframe to students at a $100 discount in our Student Store.You must provide a valid student ID or other documentation when you place your order. The student version is strictly for non-commercial use, meaning you cannot be paid for work you do with it, and you cannot use it to promote a product or service that makes money. Do you have discounts for schools / non-profits? Yes. Please visit our Special Pricing page for information on how to register for educational pricing. Can I get a price quote? What’s the best way to get that? To get a quote, fill out your cart as if you are shopping. On the checkout page, choose ‘Create a Quote’ as your ‘payment’ method. This will send you a valid quote instead of placing an order. If you need Special Pricing, register for an account according to the instructions on that page, wait for the account to be approved, and then create the quote. I live outside the U.S. Will I be charged import fees on the software, even though it’s a download? You should not be charged import fees for the software itself. Since it is a digital download, it does not appear on your shipping invoice or customs declarations. Only the hardware you purchase (such as the bluetooth or usb keypad) will be on those documents. Can I buy just the software without the keypad? The software is designed to be used with the keypad, and you will have the best experience with it. The software is always a digital download that you get immediately, even if you order the keypad. You should only be charged import fees for the software itself, since it is a digital download. It does not appear on your shipping invoice. If you still want just the software, you can find it here, or the student version here. I purchased it on Amazon. Where’s my serial number/license? If you purchased it through us on Amazon, the serial number will be on a label on the CD jacket. It starts with “D4R01”. Type it in exactly as it is, in uppercase, and with the dashes. If it doesn’t work, send us your best guess and we can find it for you. If you purchased through a different vendor, you will have to contact them directly for the license. We won’t be able to find it for you. Note: We cannot send you a serial number through email if you just purchased at Amazon. You must wait until the box arrives. How do I convert a trial into a full version? If you download the trial, you can buy a full license at any time and fully activate the program. You do not need to download the software again. When you buy the software from our site, we send you a serial number right away. Your serial number is included in your invoice, in the Products Ordered table. Note: If you buy it from another site, such as Amazon.com, you will have to wait for the box to arrive. Start the program and select Help : Activate License… from the menu. Enter your purchased serial number and click Activate to activate the software. Copy and paste the serial number from the e-mail we sent you. Don’t enter it manually. The “Registered To” field can be anything, but it must be at least three characters long. Do you ship a CD of the software? Where is my CD? If you need to have a copy of it, you can burn it to a CD or copy it to a USB flash drive. The installer is less than 100MB for each platform. Another option is to buy it from Amazon.com. In that case it will include a CD. How quickly can I start using the software after I purchase? As soon as your payment clears, we send you an invoice with your serial number in it. Note: Student orders must also wait to be approved, which can take 1-2 business days. If you haven’t downloaded the trial, you will have to download and install the software. Does your hardware have a warranty? How do I set up my bluetooth controller? Nothing happens when I turn the keypad on. I don’t get any flashing lights. If the blue light doesn’t flash, it means you didn’t actually depress the CONN. button after turning the keypad on. You must use something small, like the tip of a pen or pencil, or a bent paper-clip, to press it. Windows is asking me for the keyboard’s PIN code. What do I do? When it asks you for a code, type “0000”, followed by enter, on the Dragonframe Bluetooth keypad. Immediately after that, type “0000”, followed by enter, on your regular computer keyboard. At this point, the Dragonframe keypad should be paired with your computer. When it asks you for a code, type “0000”, followed by enter, on your regular computer keyboard. Immediately after that, type “0000”, followed by enter, on the Dragonframe Bluetooth keypad. What are the system requirements for Dragonframe? What is the software license agreement (EULA)? Can I transfer a license to a different machine? Yes, you can move your license to a different computer.In the Help menu of the application you will find “Deactivate License…”. Once you deactivate the license, you may activate it on another computer. If your original computer is no longer available, use our Find Your License page to get a list of activated machines and a link to deactivate them. Then download the latest version for your license on our Downloads page. Can I switch my license between Mac, Windows or Linux machines? I just purchased the software. How do I activate it? If you are not using a trial license, or it has expired, the license window will appear as soon as you start the program. Start the program. The license window will appear. I can’t find my serial number or license key. We can send you all serial numbers you have purchased if you know the e-mail address you bought them with.If so, use the Find Your License page. If you don’t remember the e-mail address that you purchased with or it’s no longer available, you will have to email [email protected]. Provide as much information as you can to help us find your license: previous email addresses it might be associated with, your name (or the name of who ordered it), when it was ordered, etc. The serial number is not in the correct format. Make sure to copy and paste the serial number from the e-mail we sent you. The “Registered To” field has less than three characters. It doesn’t matter what you put here, but it has to be at least three characters long. If your serial number starts with “D2”, it is a Dragon Stop Motion 2 license. You can activate any 2.x.x version. If your serial number starts with “D3”, it is a Dragonframe 3 license. You can activate any 3.x.x version. If your serial number starts with “D4”, it is a Dragonframe 4 license. You can activate any 4.x.x version. How do I activate the software on a machine that is not connected to the internet? If you are using the trial, you must activate it over the internet.For a full license, it is possible to activate it without an internet connection on that computer. Visit our Software Activation page for instructions. you probably entered the serial number incorrectly. Please copy and paste the serial number from the e-mail we sent you. If you still get this error, take a screenshot and email it to [email protected] along with any information we might find helpful (such as your name and order number). If you try to activate your license, and you get a message that says: “You have exceeded the purchased number of activations.”, then you have probably installed the software on too many machines. You are allowed to have it activated on two machines at once per serial number. Note that you are only licensed to use it on one machine at a time (per license). If you have two machines with two cameras operating at the same time, you need two licenses.If you have the software installed on a machine that doesn’t need it any more, you can deactivate a license by using “Deactivate License…” in the Help menu. If you cannot deactivate a license, because a machine is broken or missing, you can manually deactivate the serial number yourself. Enter your registered email address on our Find Your License page. We will send you an email that shows which machines have been activated, and will give you the option to deactivate them. How do I install an older version of the software? If you need to install an older version of the software, you must first uninstall or remove the current version that you have.For Windows, you can uninstall the software through the Control Panel. Run this command: sudo rm "/Library/Receipts/Dragon*"
Then you will be able to install an older version of the software. You can find previous versions on our Downloads page. How can I perform a silent command-line installation on Windows? To do a silent installation on Windows (without GUI), pass “/qn” to the installer executable. If you get the error “You must be logged in as Administrator” when trying to enter your license, you may need to Repair Disk permissions using Disk Utility.Or, if you copied the application onto a new hard drive, you should re-run the installer. It will prompt for your password. The program asks for me to activate it every time it runs. If you manually copied the application instead of installing it, the program will ask you to activate it every time it runs.You should re-run the installer. The installation zip file only had a “.pkg” file in it. You are probably running Windows or Linux, and you downloaded the Mac OS X installer.If you are on Windows, make sure to get the Windows version. Can you help me get Dragonframe working on my favorite Linux distro? Unfortunately, we don’t have the resources to help with every version of every distro. If you don’t know how to sort out potential dependency issues, please stick with Ubuntu.However, we will keep notes on getting Dragonframe to work with different distros as we discover them. If you get crashes when you plug or unplug a camera or USB device, you are hitting a ‘udev’ compatibility issue. If the program seems to be at an odd scale, perhaps with text way too large or too small, you may need to manually override the application scaling settings. The program doesn’t launch from the Ubuntu menu after I install it. We have seen this, and are not sure why it happens. Search for “Dragonframe 4” in the Ubuntu menu, then drag the program icon into the dock. Launch it from there by right-clicking on it and selecting “Dragonframe 4”. It will launch from there… and it will now launch from the Ubuntu menu. What computer would you recommend? 4GB+ RAM : The more RAM the better. SSD : A “solid-state drive” improves performance since DF reads image files from disk during playback. 13″+ screen : Don’t get a tiny laptop screen! Decent graphics card : Read reviews of the graphics card. If there are a lot of bad reviews, stay away. How do I launch Dragonframe from the command line? You can launch Dragonframe from the command line. This includes launching a scene or take. -nocrashcheck : Skips the log file check and warning at startup. <path to .dgn folder> : Dragonframe will open the specified scene and prompt you to choose a take. <path to Take folder> : Dragonframe will open the specified take. Launching a specific take. Note the use of quotes around the file path. This is required if there are spaces. Launch a scene with take chooser, and skip the crash check. You can only have one running instance of Dragonframe at a time. File paths on Windows can use forward or backward slashes. -nocrashcheck : (in DF 3.6.0+) Skips the log file check and warning at startup. Prior to 3.6.0, if the user closed the take chooser, a hidden Dragonframe process would remain running. How do I review my digital stills? You can check the focus, color, and lighting of your high-resolution digital stills using the Cinematography window. This is available under the Window menu and can also be accessed using Command-E/Ctrl-E.You can play back proxies of your high-resolution stills in the animation window. To do this, press the button that has four small diamonds in the shape of a larger diamond. This toggles between video assist images and proxies of high-resolution images. QuickTime export is black or distorted. If you try to export a QuickTime, and the result is black or distorted, check the “Pre-process” image option. Can I import images/stills to animate them? Dragonframe can import an image sequence. Look in File | Import | Image Sequence…NOTE: Dragonframe is not video editing software. It is primarily for capturing stop motion animation, not stitching together frames. If you always capture frames away from Dragonframe, there are cheaper and better ways to convert them into a sequence. Dragon Stop Motion can import an image as a background plate for a line-up layer. However, if you are trying to use DSM to animate a series of stills that you shot outside of DSM, this won’t work. You probably just want post production software, like After Effects or Final Cut Pro to stitch your frames together and edit them. 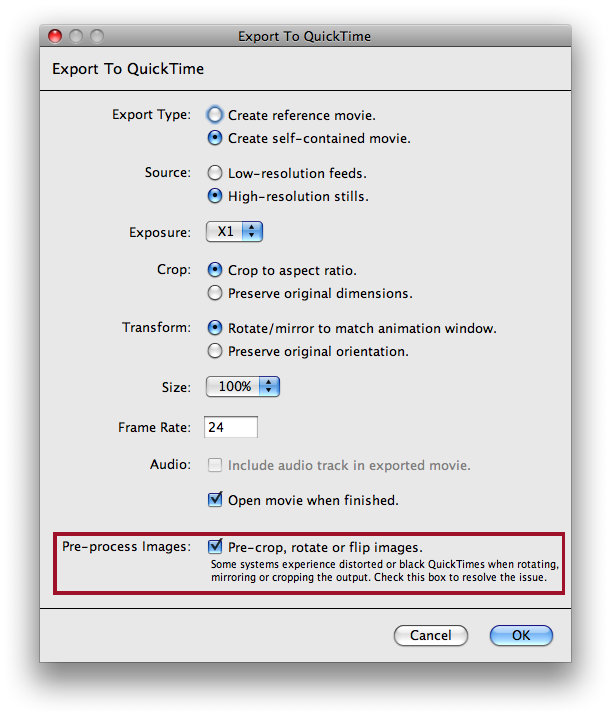 QuickTime Pro can take a series of sequentially named images and create a movie out of them, too. Export to QuickTime fails with no reason. One common reason that QuickTime exports fail is that users try to export their animation’s high-res frames at full resolution with a RAM intensive codec.For example, H.264 is not really practical for encoding images that are 4000 x 3000. It requires too much RAM. This won’t work from Dragonframe, and it won’t work from QuickTime Pro. You should consider what the purpose of your export is. If you are exporting to get the full resolution frames into post-production/editing software, use a reference movie (if your data files are on the same computer) or a self-contained movie with little or no compression. You can use Apple Intermediate Codec, for example. If you are exporting for the web or for review by others, it might make sense to use H.264 as the codec. But, in that case, you don’t need a 4000 x 3000 movie, since no one will be able to play it anyways. You can send in the program’s log files using “Report an Issue…” (formerly “Problem Report”) in the program’s Help menu. Sometimes, though, you may need to locate the log files manually. For example, if the program was crashing on startup. Please open a Terminal (in Applications : Utilities). The Logs folder will open in the Finder. Look for Dragonframe.txt in the folder. If the program crashed, you may also find a file that starts with “Dragonframe_” in the DiagnosticReports folder (within the Logs folder). If the program crashed, you may also find a file that starts with “crash” in the same folder as the logs. Look for Dragonframe4.txt in the folder. You shoot some animation, then you export it, and see your hands in the shot. They aren’t there when you play the animation in Dragonframe. What’s going on?Dragonframe always records a video assist and a hi-res separately–even if you are shooting video. So what’s happening is that your video assist frames are fine, but then you are sticking your hand in the shot while Dragonframe is capturing the “high res” frames. You can find further explanation on page 1 of the user guide. The “READY TO CAPTURE” sign at the top disappears while it is busy, and reappears when it is ready. The progress bar will appear in the middle of the screen while it is busy. When it is done capturing an image, there is a small beep afterward. Now, when you export a movie or image sequence, you can choose the source. If you want to make one from your video assist frames, it will look how it did in the animation window. You can also review your hi-res images at any point in the Cinematography workspace. Also, in the Animation workspace, you can toggle between the video assist frames and the final capture images by pressing the button with four small diamonds in the shape of a larger diamond. This allows you to preview your high-res playback as you animate. One reason there is a separate “high-res” capture source for video is that you can add frame averaging (video sources only), which greatly reduces video noise, and you can save your images in TIFF format instead of JPEG. Also, with very high-resolution cameras (such as 1920×1080 HD or 1600×1200 video cameras) the video assist will be stored at a lower resolution, and the high-resolution captures will be full size. Any time there is a difference between what you see in the Animation workspace vs. what you see in an export, it’s important that you understand the difference between “video assist” (which is what you see in the Animation workspace) and “high-res” images (which is what you usually are exporting). If you are not sure about the difference, read the “Big Picture” section of the User Guide. In this specific case, the problem is almost certainly that you have “Image Stabilization” engaged on your camera lens. Ironically, the way image stabilization engages every time the camera shoots can pull the lens into different positions, causing the shakiness in the high-res captures. Then the image stabilization relaxes during live view, and the lens settles back into a consistent position. Note that our camera setup instructions for Canon cameras tell you to turn off Image Stabilization. Windows Only:Dragonframe 3.5+ uses OpenGL v2.1 to provide high-performance graphics processing. “The driver for your graphics card is too old and must be updated. If this is the case, there is a good chance you can resolve the problem by updating the driver for your graphics card. (Intel HD on Windows XP/7 requires driver 8.15.10.2450 or newer). Generally, the Device Manager’s option to check for driver updates will NOT work. It always says your graphics card driver is up to date. One option is to check your computer manufacturer’s website for drivers specific to your model. Also, if you have a laptop with both an integrated and discrete graphics cards, see if you have the option of always using the discrete card with Dragonframe. In general they perform much better than the Intel integrated cards. The issue is caused by some other program setting a global library path, which is a very bad thing. There may be more than one program that does this, but we’ve found that older versions of an application called “Tracker” does this. If you installed Tracker version 4.84 or older, you should uninstall it and then install version 4.85 or newer to resolve the issue. It will ask for your password. This is your machine password that you use to log in. It does not show it to you as you type. In the editor that opens, remove anything that says “DYLD_LIBRARY_PATH”. If you can see live view in the Animation workspace, but don’t see any images in the Cinematography workspace, then you probably have an outdated graphics card driver.We have seen this with ATI graphics cards with older drivers. Nothing shows up in the Cinematography workspace. If you update to the latest drivers, the problem will go away. Dragonframe 3.5 and newer accepts most standard audio formats including WAV, AIFF, MP3 and others. If you are on the Mac, you can get a free program called “Audacity”. Open your file with it, and then save it as a WAV file. It will be compatible with Dragon Stop Motion and Dragonframe. You can also use iTunes to convert the file. Basically, you go to the iTunes Preferences, select “Import Settings…”, and choose Import Using “WAV Encoder”. Then select your audio track in iTunes, go to the Advanced menu and select “Create Wav version”. You should be able to import that version into Dragon Stop Motion or Dragonframe. I have a numeric keypad that’s not working properly. If you are using a numeric keypad to control Dragonframe, make sure that Num Lock is On. Otherwise the key commands will be interpreted incorrectly. 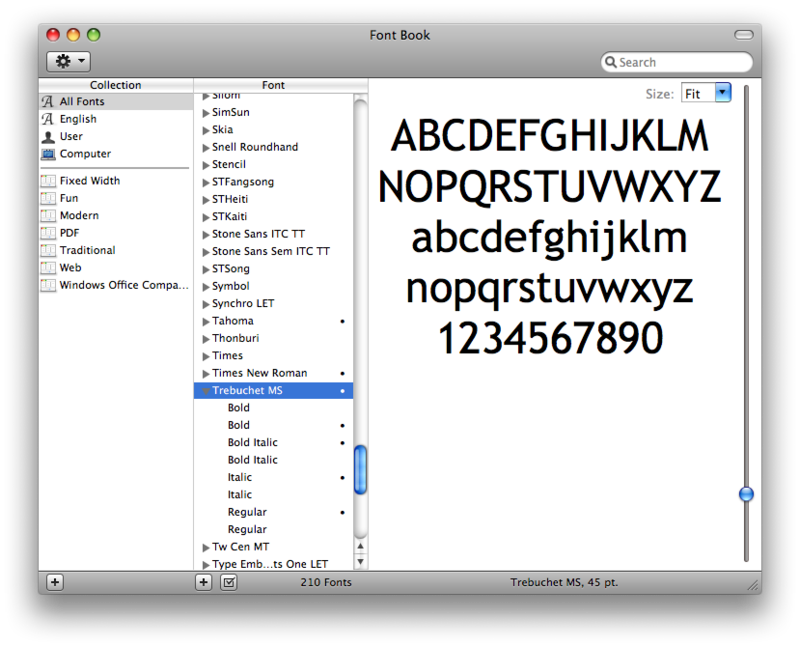 Launch the Font Book application in the Applications folder. Select Trebuchet MS in the Font list. Select Edit -> Resolve Duplicates. The goal of the free trial is for you to test it with your camera, and to familiarize yourself with how the software works. We have a list of supported cameras, along with setup instructions and troubleshooting for camera issues. You will enter your email address, and our system will send you a special trial serial number (license key), along with further instructions. I didn’t receive my trial code. Where is it? If you don’t have your trial code after 10-15 minutes, it probably got sent to your Spam/Junk or Promotions folder. Hotmail accounts almost always send our messages to Spam. Google/Gmail accounts usually send them to Promotions. The message comes from from: DZED Systems LLC ([email protected]) with subject Dragonframe Software Trial. You can shoot up to 50 frames per take. Images will have a subtle watermark that cannot be removed. Camera RAW formats are not supported. Otherwise the software is fully functional. Can I remove the watermark from the images I shoot? The free trial places a watermark (semi-transparent Dragonframe logo) over all of the images you shoot. You cannot remove this watermark. Can I remove the watermark if I buy the software? The free trial places a watermark (semi-transparent Dragonframe logo) over all of the images you shoot. The watermark cannot be removed from images you shot with the trial. When you buy the software, any new images you capture will not be watermarked. But you cannot un-watermark images you shot during the trial period. Can I start a project with the free trial? The free trial is only for you to test your camera and get used to how the software works.Because the trial places a watermark on your captured images that cannot be removed, it is not suitable for starting a production. Once you decide that the software meets your needs, you should purchase the software before starting on a project. I need help with my camera! Please review all of the information in the Camera FAQ here, and visit the Camera Support page to find setup instructions for each camera Dragonframe supports. If you are still having trouble, send in a Problem Report through the program’s Help menu. What camera should I get? What do you recommend? We recommend Canon EOS DSLRs, specifically the ones listed on our supported cameras page.The Canon EOS cameras have a large live view with exposure simulation. They also have smooth mechanics during capture. Get the Canon EOS 5D Mark II or 5D Mark III if you have a larger budget. If you want a full-frame camera at a lower price, look at the Canon EOS 6D. If you have a limited budget, you can look for used Digital Rebels (or 450D/1000D) on Amazon. What mirrorless cameras can I use? Dragonframe 4 supports many full-frame mirrorless cameras, including the Sony Alpha A7 series, Canon’s EOS R and RP, and Nikon’s Z6 and Z7. Additionally, the Olympus, Fujifilm and Panasonic cameras we support are all mirrorless (but not full-frame). See our camera support page for the most up-to-date list of supported models. Note that some of the earlier Sony models do not send the live view over USB. What Micro Four Thirds, MFT, M4/3 camera can I use? Dragonframe 4 supports Olympus OM-D E-M1, E-M1 II, and E-M5 II, as well as Panasonic DC-GH5, DC-GH5S and DC-G9. Those all work really well with the software. See our camera support page for the most up-to-date list of supported models. How can I shoot with a RED Digital Cinema camera (Weapon, Epic, Scarlet, etc)? Dragonframe 4.1 and newer support direct R3D capture from RED DSMC2 cameras. You need to use the Gig-E connector, which may require a specific back-plate and cable accessory. See the instructions on our camera support page. I plugged an HDMI cable into my camera and my computer. Why isn’t that working? Unplug it right now! The HDMI port on your computer is an output only—for sending the screen to a monitor or HDTV. Any of the supported still cameras should be connected via USB. Why isn’t my camera supported? It has a USB port! Most digital still cameras have USB ports, and can be used with a computer to download images from the camera. However, that is the extent of the common functionality. Most cameras do not have any type of tethered shooting capabilities, where the computer can change settings and trigger the camera to capture an image. And cameras that have tethered capabilities (such as Canon and Nikon supported models) have very different interfaces. We try to support as many cameras as we can reasonably do. What don’t you support GoPro cameras? I need a really small camera. We found that the GoPro WiFi interface was basically unusable for Dragonframe. The connection was slow and often failed. The quality of the grabs was fairly awful, and some of the auto-exposure and auto-focus features could not be disabled, so the camera was unusable. If you need to use a small camera, look at the Ximea cameras we support. Why don’t you support all of the Canon EOS M series? Dragonframe supports most Canon EOS cameras. However, most of the Canon EOS M cameras are not supported because Canon does not provide tethered shooting support for them. You may notice that Canon’s own EOS Utility does not support tethered shooting with the ‘M’ series cameras. The latest EOS M camera, the M50, is supported in Dragonframe 4.1 and newer. Why don’t you support the Nikon D3000 or D3100? 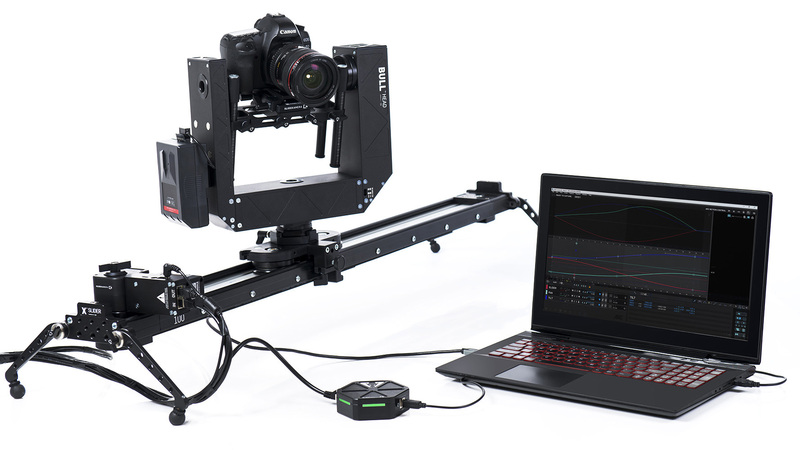 Dragonframe supports most Nikon DSLR cameras. However, the D3000 and D3100 cameras are not supported because Nikon does not provide tethered shooting support for them. You support the iPhone as a capture device. Why don’t you support Android? Apple provides a fairly easy way to communicate between a desktop application and a device, over the tethered USB connection. That is how we are able to support iPhones. Android requires the user to install developer tools (and know how to use them) in order to support something similar. This is not something we want our customers to deal with. Can I use the iPhone as a capture device in Dragonframe 3, or in Dragon Stop Motion 2? No. You must use Dragonframe 4, along with Dragonframe Tether on the phone, in order to use it as a capture device. Why don’t Olympus cameras work with macOS 10.11 (El Capitan)? Well, it’s kind of technical… Basically Apple decided to use some of the same PTP event codes as Olympus, and so Apple does not pass the events on to the end application. They fixed it in macOS Sierra, but chose to leave it unresolved in El Capitan. This is where a basic photography class could be helpful. There are all sorts of considerations for lenses, angles of view etc. Here is a simple rule to help you out: if you are shooting miniatures—imagine there is a tiny crew of people shooting your film. Where would they put their little camera? If you are shooting an interior—put the center of the lens about where it could fit in that room. Then pick the focal length that shows what you need for the shot. This is just a starting point. Get books on cinematography. Watch great films. We hope this helps! Note that we strongly recommend using a manual aperture lens (such as a Nikon lens) with a Canon body. With a digital lens, the aperture will close down to slightly different positions for each shot. This is not a problem for still photography, but for stop motion or time-lapse it creates “flicker”. For Canon cameras, use a Nikon manual aperture lens with a Nikon to Canon lens adapter. For Nikon cameras, use a Nikon manual aperture lens and put masking tape over the lens’ electrical contacts. A manual aperture lens has a physical ring for controlling aperture. Do not get a ‘G’ series lens, which has no aperture ring. Here is a blog post from Adobe that describes the issue. The USB cable is too long. The USB cable is defective. The USB port on the computer/hub or camera is damaged. The power supply to the camera is interrupted. Use a short USB cable (preferably the one that came with the camera). Plug the USB cable directly into the computer (not through a hub). Power the camera over AC. If this setup works, slowly change your configuration to identify the problem. First, make sure your camera is supported by visiting the Camera Support page, taking care to note which versions of Dragonframe support the camera (if any). Follow any setup instructions provided. Then you will want to verify that the computer itself can see the camera. If you are on a Mac, use “Image Capture”, which is an application that comes with the computer and is located in the “Applications” folder. On Windows, you can see if the camera connects when you plug it in, since Windows always pops up a message for new devices. If you have a Canon camera, you can also use “Canon EOS Utility” on either platform to detect the camera. If you have Nikon Camera Control Pro 2, you can check that as well. If the operating system or other programs can see your camera, but Dragonframe does not, you should definitely send in a camera test (see Dragonframe Help menu) and also contact support. If nothing can see your camera, try using a different USB cable and port, and possibly try your camera with another computer. Anti-virus software blocking camera detection. If you have anti-virus software, make sure to white-list Dragonframe so that it can access the camera. This issue always seems to be related to the USB connectivity issues we describe above. For some reason, the cameras tend to freeze when there is poor USB connectivity. You can actually see the same problem in Canon EOS Utility as in Dragonframe. We have notified Canon and are also exploring alternate solutions. The solution for you is to use shorter USB cables or buy a better USB extension cable. Increase the shutter speed (to at least 1″). Open the aperture (go to a lower number). If you have a manual lens then open it up all the way. Increase the amount of light in the room. If the live view remains black, send in a Camera Test through the Help menu. Accept this difference and live with it. Switch to a manual aperture lens with a lens adapter. If you are using a Canon camera, you can set the live view to use depth of field preview. In Dragonframe, press Command-K (Ctrl-K Windows) to open the video settings. You can turn on depth of field preview. First of all, it is super important to understand that the live view and high-resolution images are different. In the cinematography workspace you set up your high-resolution capture settings and take test shots to make sure that your final images will look correct. In the animation workspace you are typically working with the video assist images from your camera, although you can switch to review your high-res images. Most of the Nikon cameras do not have live view “exposure simulation”. This means that their live view exposure level auto-adjusts all the time, and does not reflect changes in camera settings. In this case, you will have to live with the difference. Make sure to check your high-resolution images early and often. The Canon live view DSLRs all have exposure simulation. It is either “always on”, or there is a setting to turn it on. If there is a setting, it will be called out in our setup instructions. Just make sure you’ve followed that step. We recommend using a manual Nikon lens on Canon body, because this avoids flicker. The downside is that this can affect the live view exposure simulation of the Canon cameras. Usually you can adjust the live view to match the high-resolution images by adjusting the “Exposure Preview Offset” in the Cinematography workspace’s Camera Settings. You can read more about the problem and see another solution here. Sometimes the internal live view calculation is thrown off by the last digital lens connected. Attach a Canon digital lens to the camera. Open the aperture as much as it can go (lowest f/stop number). Power down the camera and then try your Nikon lens. If you still can’t get close with the exposure preview offset, let us know. Possible Cause #4: The sensor isn’t getting enough light. We often get calls from people who are on a dimly lit set, with their aperture stopped down to f/22, and with “Exposure Preview Offset” set all the way to “+4”, and they want to know why the live view doesn’t match their high-resolution image. This is especially problematic for manual aperture lenses, since the aperture is always stopped down. The reason is simple: the lens doesn’t have enough light. You have exceeded the limits of the live view exposure simulator (inside the camera). Increase the lighting on your set. Use a bash light (also called a work light). This is a light that is on for the animator and video assist, but off for the high-resolution capture. Use the DDMX-512 to control a bash light through DMX. Use the DDMX-512 to control a bash light through a relay. Go to Preferences : Capture and set a capture delay of several seconds. Turn a light off after you press the shoot button, and then back on after the high-resolution image is captured. In the Animation workspace you typically are looking at the live view and stepping back to other video assist images you already captured. These should always line up perfectly. Now, you switch to view the high-resolution proxies in the animation workspace, because you want to see your “real” images. But when you step between live and the other frames, the image doesn’t line up perfectly. There is no real solution to this problem. Dragonframe gets the live view and the high-resolution images directly from the camera. Unfortunately these are not framed exactly the same, and so they will just be off. But that’s why we have the live view, so you can animate with it. If this is super important to you, there is something you can try. You may find that certain image sizes have framing that more closely matches the live view. You can adjust the image size in the Cinematography window’s Camera Settings, and compare to the live view. For example, the Large JPEG might use a slightly different section of the sensor than the Medium JPEG. You can experiment to see which matches the best. If your live view has light bands that move across it, you are probably dealing with an issue between the refresh rate of your live view and the lighting source. One potential source for this is your lights, especially if they are fluorescent. In that case, you may need different lights. This can also happen with very fast shutter speeds. If you slow the shutter speed down to 1/2 second or slower, does the problem go away? If this happens, your camera thinks it is in movie mode. That’s why it’s limiting your shutter speed range. Make sure to follow our camera setup instructions. For Nikon cameras you need to turn off Manual movie settings in the Movie Settings. Dragonframe provides a workaround. In the Cinematography workspace set External flash to On. Dragonframe will disengage the live view prior to capturing the high-resolution image, allowing the external flash to fire. Check if the hard drive is full. You can fill it up quickly shooting RAW files! Check if someone moved or renamed the folders out from under you. For an external or network drive, check if it was removed or disconnected. Check if the permissions for the folder/drive are not allowing you to write to it. What hardware is compatible with Dragonframe’s DMX workspace? One of these hardware devices is required to get a DMX512 signal from Dragonframe out to your lighting hardware. How many lights can I program with Dragonframe? Dragonframe 4 supports up to 512 lighting channels. The DMC+, DMC-16, and DDMX-512 all support 512 channels. The DDMX-S2 only supports 99 by default. However, you can purchase a DDMX-S2 Upgrade Chip to make it support 512. Dragonframe 3 supports up to 99 lighting channels. This is a limitation in the software, even if you buy the DDMX-512 or other hardware than can support 512 channels. What DMX dimmer pack should I get? If you are looking for a decent, inexpensive dimmer pack, check out the 4-channel models from Elation, such as American DJ DP-415. We do not recommend Optima dimmer packs. They have random flickering.Note that standard dimmer packs, such as these, are for incandescent lights. Do not try to use them for other lights, especially not lights that have their own transformers. Can I use a microphone cable for DMX? You should not use a microphone cable for DMX, even though they have the same XLR connectors.They are not built to the same specifications. What DMX dimmer pack do I need for this LED light I want to use? We have no idea. You almost certainly do not want to use a standard dimmer pack that uses current modulation (PWM).Usually LED lights, if they can be dimmable, have their own system to do it. Some LED panels have DMX input directly on them, so you would just plug the DMX cable into it. The best thing to do is talk to the manufacturer or read the documentation. Message: The DMX program has channels that are out of range for the current DMX device. If Dragonframe gave you that message, it means that the DMX-capable device you connected to Dragonframe does not support all the channels you have in your scene’s program. For example, if your scene has 200 channels, but you connect a DDMX-S2 (which only supports 99 channels), you will get this message. For the DDMX-S2, you can order an upgrade chip from our site to get 512 channels in Dragonframe 4 or newer. Can I use more than one DMX controller within Dragonframe to control more lights? You can only use one DMX controller (DDMX-512, DDMX-S2, DMC-16 or DMC+, for example) to control lights. You cannot add multiple controllers to access more lights. Please note that this has nothing to do with how many dimmer boxes you use. You usually need to use multiple dimmer boxes. What hardware is compatible with Dragonframe motion control workspace? The Dragonframe Master Controller is our flagship motion control coordinator.It comes in two varieties: The DMC-16 and the DMC+. The DMC-16 has 16 channels of step and direction that you can wire to your stepper motor drivers. The DMC+ provides powered drivers for channels 1-8, and step/dir signals for channels 9-16. Use the DMC-16 with your own stepper motors drivers. Use the DMC+ with your own stepper motors (or drivers for channels 9-16). Arduino is an inexpensive, open-source hobby computer. We provide a special program (“Sketch” in Arduino world) called “DFMoco”. It provides 4-8 channels of step and direction output (depending on the Arduino model).We provide this sketch as a convenience, for people who are comfortable working with electronics and are interested in creating a homemade, low cost, simple motion control solution. We do not offer customizations of the DFMoco sketch (although you are free to do it yourself). An Arduino running the DFMoco sketch will generate step and direction signals for stepper motors. If you already have stepper motor drivers, you can take these signals and wire them into a connector for those drivers. If you do not have stepper motor drivers, and need to move relatively small stepper motors, you can wire the Arduino signals to a Big Easy Driver or comparable board. You will use one Big Easy Driver for each stepper motor. The pin-out for each step and direction signal is described in the DFMoco sketch. The eMotimo spectrum ST4 is a full-featured 4-axis controller with integrated pan and tilt control. Additionally it has two powered motor output typically paired with a slider and focus motors. It is accurate, repeatable, and supports cameras weighing up to 15lbs. The eMotimo is the only third-party motion control equipment that implements our real-time protocol. This makes it faster for programming moves, performing tests, and even capturing real-time video. DitoGear produces motion control sliders, pan/tilt heads, and focus motors that are compatible with Dragonframe. 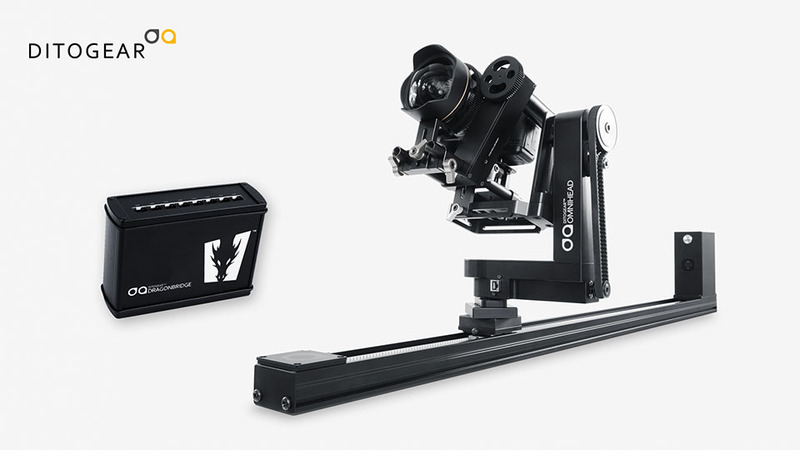 The DitoGear OmniSlider, OmniHead and LensDrive can be used with Dragonframe when paired with either the DitoGear DragonBridge or the DMC-16 motion controller. For non real-time shooting, choose the DitoGear DragonBridge. This runs the DFMoco program to provide shoot-move-shoot capabilities, and is a great low cost option. For real-time shooting, you must use the DMC-16 along with DitoGear DMC-16 adapters. Slidekamera produces high-quality linear sliders and pan/tilt heads. Their Dragonframe Adapter provides a direct integration between Dragonframe and Slidekamera hardware. The Slidekamera Dragonframe Adapter is non real-time (shoot-move-shoot only) when used with Dragonframe. Dynamic Perception produces rugged, light-weight linear sliders and pan/tilt heads. Their NMX Digital Motion Controller (3-axis stepper controller) is now Dragonframe compatible. The NMX Digital Motion Controller is non real-time (shoot-move-shoot only) when used with Dragonframe. SmartSystem is an Italian-based company that creates high-precision linear sliders. Their SmartSlider Reflex S employs a unique fluid drag system to reduce vibration. The DigiDRIVE Portable is a Dragonframe compatible controller. It can control all of the DigiDRIVE hardware. The DigiDRIVE Portable is non real-time (shoot-move-shoot only) when used with Dragonframe. What is real-time vs non real-time shooting? When choosing a motion control system it is important to understand what we mean when we say a rig supports real-time shooting. Real-time shooting in Dragonframe means that Dragonframe can run a move at full speed, or reduced speed, with all axes fully synchronized. If you want to program real-time moves (for live action) in Dragonframe, you need a real-time capable rig. A real-time rig makes shooting test moves much faster and smoother. A non real-time rig will move each axis to the next position of a move at separate speeds. This is perfectly adequate for shooting stop-motion animation. You cannot run a live action move with a non real-time rig. Note: Some rigs are capable of real-time shooting when used with the third-party’s custom controllers, but their Dragonframe integration may only provide shoot-move-shoot capabilities. Will Dragonframe work with this motion control rig I bought (or found or am interested in)? We try to maintain a list of compatible hardware in our faq (see previous questions).There is no standard protocol for operating with motion control hardware, so unless it’s on our list, or Dragonframe support is listed on the manufacturer’s page, it’s not going to work. The third party manufacturer must integrate their system with Dragonframe in order for it work. But I found a really cool robotic arm! Will Dragonframe work with it? Robotic arms work very differently from typical motion control cranes. We do not have the expertise to create any type of integration, or to offer any help if you attempt to do it. The only integration you could reasonably do is to use separate software to program moves on the arm, and just work with Dragonframe to tell the other system when to advance to the next frame. Why won’t Dragonframe do real-time motion control with Slidekamera/Dynamic Perception/other? Most hardware vendors integrate to Dragonframe using our DFMoco protocol (the same that we offer for free as Arduino code). The is a non real-time protocol. It provides shoot-move-shoot motion control, and is sufficient for almost all stop-motion animation. The eMotimo spectrum ST4 is the first third-party system to directly implement our real-time protocol. This makes it easier to create and test moves, as well as shoot live video. Ditogear offers DMC-16 adapters that allow their hardware to be run in real-time from our DMC-16. I hooked up an Arduino Motor Shield and it’s not working! Our DFMoco sketch for Arduino is not compatible with motor shields.The comments at the beginning of the sketch specify which output pins it uses for step and direction. You will have to make your own connection to motor drivers. How do I connect for SmartSystem DigiDrive Portable to Dragonframe? Please review the Dragonframe Setup on the SmartSystem site. How do I connect for Dynamic Perception NMX Controller to Dragonframe? Please review the NMX Dragonframe Support on the Dynamic Perception site.For Dragonframe 4, add a device and choose DFMoco as the Device Type in the Connections screen. How do I connect my Cognisys StackShot 3X to Dragonframe? Please review the StackShot 3X Manual on the Cognisys site. How can I run a process after Dragonframe captures an image, or after some other event? Dragonframe can call a local script file whenever certain events occur. Back up your high-resolution images whenever a new image is downloaded. Color process your RAW files whenever a new image is downloaded. Notify a content management system whenever a frame is captured. Instruct a motion control application to advance its position whenever Dragonframe moves to a new frame. SHOOT : As soon as the user triggers a frame capture. DELETE : As soon as the user deletes an image. POSITION FRAME : When Dragonframe is ready to capture another frame/exposure. CAPTURE COMPLETE : When Dragonframe has downloaded a high-resolution image from your camera. FRAME COMPLETE : When Dragonframe has captured all exposures for a frame. TEST : When Dragonframe has downloaded a high-resolution image from your camera as a test shot. EDIT : When Dragonframe has performed a timeline edit (cut/copy/paste). CONFORM : When Dragonframe has completed conforming edits of a take. Your script file is a bash script (“.sh”, for macOS or Linux) or a batch file (“.bat”, for Windows). Start with our documented examples and go from there. Using the Simple Interface to receive notifications and send commands to Dragonframe via serial or TCP. The Simple Interface is a basic protocol in Dragonframe that can be used over a serial port (or virtualized serial port) or TCP. You can send commands to Dragonframe and receive notifications from it. It may be a useful integration point for using Dragonframe with other devices or applications. It is the same protocol used by the DFRemote Arduino sketch (not the DFMoco motion control sketch). After creating a device that sends/receives these messages, use the program’s Scene | Connections and add a connection of type Simple Interface / Serial or Simple Interface / TCP, depending on your implementation. Using the JSON interface to receive notifications and send commands to Dragonframe via UDP. The JSON interface is a UDP based protocol in Dragonframe, that uses the JSON format for messages. After creating a device that sends/receives these messages, use the program’s Scene | Connections and add a connection of type JSON. Note: The optional ‘view frame updates’ feature can be turned on with command = ‘viewFrameUpdates’. This instructs Dragonframe to send a ‘viewFrame’ message every time the user toggles to a different frame. We provide a sample Qt application that implements this interface. You can find the project here. You must compile it with Qt 5.3 or newer.